The mysterious 6.16 Fancy Dark gray-blue Farnese Blue diamond, graded by GIA, will be auctioned by Sotheby’s May 15 in Geneva. Mined at Golcanda, the legendary source of the Hope Diamond, this jewel was given to Elisabeth Farnese upon her marriage to Phillippe V of Spain in 1714. Unlike other royal jewels, this diamond was kept in a small wooden box away from the public eye for more than two centuries until this sale. The French script on the silver plaque on the box reads: “Remarkable blue brilliant. This historical stone was offered by the Philippine Islands to Elisabeth Farnese, Queen of Spain, wife of Philippe V, great-grandfather of the Comte of Villafranca, current owner of that stone.” Photo courtesy of Sotheby's.The record-breaking array of major fancy colored diamonds and large colorless diamonds are less evident this spring auction season, as buyers around the world turn more cautious. While some impressive diamonds and colored gemstones are still being offered in the top venues – Hong Kong, New York and Geneva – the emphasis is on classic pieces from jewelry houses, such as Cartier, Boucheron, JAR and Van Cleef & Arpels, and smaller fancy colored diamonds. The first major sale of the season, Sotheby’s April 3 Hong Kong auction, saw most of the top lots fail to sell. The highlight of the auction was the Circle of Heaven, a jade bangle estimated to sell for between $10.2 million and $12.8 million, failed to find a buyer. Prices for top jade have softened, but the wide publicity Sotheby’s provided for this piece indicated that the house jewelry department was confident it would achieve that price. Also not sold: a 17.63 ct D Flawless diamond, estimated at $2.8 million, and a 14.18 ct Fancy blue diamond. The 5.01 ct Fancy Vivid purplish pink diamond offered at the auction sold for $2.5 million, which was well below what similar diamonds have sold for in previous sales. 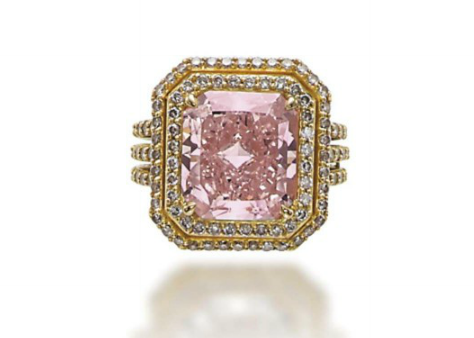 Christie’s April 17 New York auction featured a GIA-graded 8.42 ct Fancy Intense pink estimated at $4 to $6 million, which sold for $ 5 million, but the majority of top lots were signed period and modern pieces from the major jewelry houses. Another top lot was a ring by Paris designer JAR featuring a GIA-graded 22.79 ct D Flawless l “elongated oval” cut diamond estimated at $2.5 to $3.5 million, which went for $2.8 million. In addition, there were about 20% fewer lots in this sale than in previous spring New York auctions.. This 51.71 ct D Flawless Type IIa round diamond is expected to bring between $7 to $9 million at Sotheby’s May 15 auction in Geneva. The diamond is one of two 50-carat-plus diamonds of that grade offered at the sale. Both were graded by GIA. Photo courtesy of Sotheby'sSotheby’s is betting that buyers will pay $7 to $9 million each for a pair of 50 ct-plus D Flawless Type IIa diamonds highlighting its May 15 Geneva sale. One diamond is a 51.71 ct round brilliant while the other is a 50.39 ct oval shape, according to GIA grading reports. The house is also offering the historic GIA-graded 6.16 ct Fancy dark gray-blue diamond, known as the Farnese Blue. The royal diamond, originally from India’s famed Golcanda region that produced the Hope Diamond, has a history almost as fascinating. The diamond was a gift to Queen Elisabeth Farnese of Spain by her husband King Philippe V in 1714. It was passed to the queen’s son, Philippe, Duke of Parma, and then through various Italian noble families and ultimately to the Habsburg family in Austria – all the while keeping its existence secret from anyone outside the immediate families. The diamond is expected to sell for $3.7 to $5.3 million. DIAMONDSDe Beers announced that its April rough diamond cycle totaled $520 million in sales, which is about 12% lower from the same period last year and 8% down from the previous cycle. The company did not announce a price increase, though some press reports indicated that prices were slightly higher in some categories. De Beers often adjusts prices slightly in the mix of goods offered to clients. Russia’s Alrosa, the world’s largest diamond producer by volume, reported that its March sales total was $559.5 million, which also includes polished diamonds from special tender auctions. The total was $18.4 million higher than February because of increased sales of large diamonds, according to Alrosa deputy CEO Yury Okoemov. Russia’s first quarter diamond sales totaled $1.61 billion, $1.58 of which were rough diamonds, Okoemov noted. ​Amber - Thought to aid memory loss, purify the body, alleviate headaches, and address bone and heart problems, Amber is known for its stress relieving and calming properties. Garnet - Aids blood, heart, and lungs and is known to promote romantic love, passion, sensuality, and intimacy. Lapis - Thought to aid in the alleviation of insomnia and depression, Lapis is also known for creating openness, truthfulness, and creativity. Onyx - Associated with the root chakra, Onyx brings spiritual inspiration, and control over emotions. 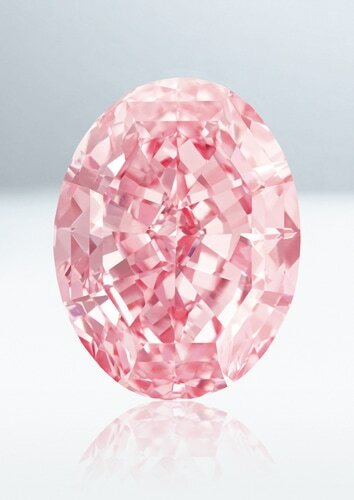 A rare pink diamond known for its oval shape and vividly pink hue became the most expensive gemstone ever sold at an auction on Tuesday, fetching a record sale price of $71.2 million in Hong Kong. The 59.6-carat “Pink Star” was sold to the highest bidder at the Sotheby's auction at the Hong Kong Convention and Exhibition Center. It surpassed the current world record holder,“Oppenheimer Blue,” a 14.6-carat diamond sold for $57.5 million at a Sotheby's auction in May in Geneva. The sale also eclipsed the current record holder for a pink diamond sold at auction. “Graff Pink,” weighing nearly 25 carats, was sold at Sotheby's in Geneva in 2010 for $46.2 million. “Pink Star's buyer is Hong Kong-based jewelry empire Chow Tai Fook, which outbid two other telephone buyers. Founded in 1929, the family-owned conglomerate owns a chain of jewelry shops in China and is one of the world's largest jewelers. Last month, it acquired Alinta Energy Holdings, an Australia-based energy company, for $3.1 billion, Bloomberg reported. Chow Tai Fook also made Forbes's list of Asia's Fab 50 companies in 2014. What in a Diamond's carat weight. The term “carat” is the standard unit of weight for diamonds and other gemstones. The name originates from the carob seed, which was the original unit of measure for diamond traders. In 1913 the United States implemented the modern metric carat, which is equal to 0.2 grams, and other countries soon followed. Today, a carat means the same thing everywhere in the world. A carat can be further divided into 100 points, allowing for very precise measurements. This is critical for jewelers as even a very small weight difference can have an impact on the overall diamond value and pricing structure. Crown Area – this is the total surface area of the top of the diamond (measured in mm2). It shows the size of the diamond as it appears face up, similar to how we view a diamond when set in a ring. Cut Proportions – if two diamonds are the same carat weight and shape, but one carries a larger percentage of its weight in its depth, then the table percentage (flat section at the top of the diamond) and overall crown area will be smaller, giving the impression that the diamond is smaller from the top. The photo (right) shows two 1 ct. round diamonds, but the diamond on the left is cut deeper and therefore has a smaller table percentage across the top. Shape – diamond shapes such as oval or marquise have elongated lengths, resulting in the appearance of a larger size per carat weight. Sometimes this size difference can be real, however, it can also be just an illusion based on perception. It is important to explain to your customers how these different factors affect the perception of diamond size. A diamond with a higher carat weight is likely to be more expensive, but may not look that much larger than a smaller carat weight diamond once set in jewelry. Help your customer find a diamond that gives the largest perception of size for the jewelry setting they like, while staying within their budget. A 57 Million Dollar Diamond WOW! Big diamonds – really big ones– dominated the news in May. Christie’s sold the 14.62 carat (ct.) Oppenheimer Blue for the highest price ever paid for any gemstone at auction: $57.5 million. Also, mining company Lucara Diamond Corp. auctioned one of its major finds − a 812.77 ct. rough − for over $63 million and will sell its 1,109 ct. rough diamond named Lesedi La Rona at the end of next month. Lucara auctioned the 812.7 ct. diamond May 8 with the winning bid going to a Dubai-based firm, Nemesis International. It was a record price for a rough diamond and unlike most diamond tenders, which are outright sales, it was for a 90% share in the stone, with the remainder held by Lucara. The record price will certainly buoy expectations for Sotheby’s June 29 auction of Lucara’s 1,109 ct. stone – the second largest rough diamond ever found. That auction will be very public, conducted at Sotheby’s in London. Lucara had said it expected to sell for more than $70 million, a safe assumption after the smaller of the two fetched 90% of that price. As if the Lesedi La Rona’s 1,109 carats (originally reported at 1,111 cts.) were not large enough, the company announced that a 374 ct. rough found the day before had once been part of it. The company said it did not know if the piece broke off naturally or during the mining process. GENEVA - Once in a blue moon, the earth sends forth a coloured diamond. Intense and intriguing, the stone may be yellow, pink, orange or violet, yet its fiery brilliance and exquisite colour – the most powerful emotional triggers in a gem – always come together with dramatic effect. Among these coveted stones (there is one for every 10,000 gem-quality white diamonds found), the blue diamond is considered the rarest, most captivating and most enigmatic treasure. THE BLUE MOON BEING PRESENTED TO THE PRESS AT SOTHEBY’S IN LONDON IN SEPTEMBER 2015.All of that changed in January 2014 with the appearance of a 29.62-carat rough blue diamond crystal. Following much press excitement, the diamond was purchased by Cora International, one of the world’s leading firms specialising in cutting large important diamonds. Cora’s experts spent approximately six months deliberating, planning and painstakingly cutting the rough into a magnificent cushion-cut 12.03-carat diamond of perfect proportions. 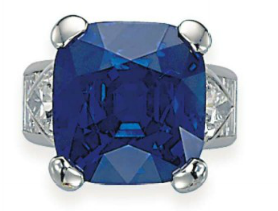 In its detailed monograph, the Gemological Institute of America (GIA) classified the diamond as “fancy vivid blue” and “internally flawless,” hailing it as a “rare wonder.” A pinnacle of perfection with top classifications, the stone was named the Blue Moon and garnered much attention when it went on view at the Natural History Museum of Los Angeles County in August 2014. But when the exhibition closed this past January, the Blue Moon retreated to a vault. One of the largest known fancy vivid blue diamonds, the Blue Moon is now re-emerging as the dazzling centrepiece of Sotheby’s November sale of Magnificent Jewels and Noble Jewels in Geneva. The last time a vivid blue diamond was polished from the rough was in 2009, when the 7.03-carat Star of Josephine, from the same Cullinan mine as the Blue Moon, fetched $9.5 million at Sotheby’s Geneva, then a record price per carat for any diamond. The Blue Moon will be collectors’ ultimate object of desire, as well as one of tomorrow’s historic diamonds. For David Bennett, Sotheby’s Worldwide Chairman for Jewellery, the Blue Moon represents “the most mysterious and romantic” of coloured diamonds, its deep blue giving it a hypnotic magnetism. Almost other-worldly, unknowable and absolute, this spectacular specimen is simply awe-inspiring. Beyond exceptional colour, brilliance and clarity, the Blue Moon, classified as a type IIb diamond, radiates with a captivating inner life. According to the GIA, type IIb diamonds are electrically conductive and known to phosphoresce, usually turning dark blue or green under ultraviolet light. Remarkably, the Blue Moon phosphoresces red, which infuses it with a flaming passion, another extraordinary quality. Maximising these natural gifts, the Blue Moon also demonstrates diamond cutting’s new levels of excellence and expertise. The world’s elite diamond cutters have the ability to see into the heart of a stone, unveiling its secrets while understanding its intricate structure. Cutting and polishing a coloured diamond of immense value requires exceptional intuition, skill and experience, not to mention diamantine nerves, which the Blue Moon’s realisation embodies to the highest degree. Its exquisite cutting is clearly the result of a true art form, a blend of art and science, of the superrational with the hyper-instinctive. It should be noted that blue diamonds pose very specific challenges to gem cutters. Unlike white diamonds, type IIb blue diamonds are rarely symmetrical in structure; their internal angles are often likened to the knots in a piece of wood, making the cutter’s work all the more perilous. In addition, such stones often reveal uneven colour distribution, known as colour zoning, another parameter for the cutter to consider. One miscalculation, one slip, can mean the colour disappears entirely. But while a blue diamond may present the greatest challenge for the diamond cutter, technical advances and increased understanding of coloured diamonds have also enabled experts to deepen precious stones’ intensity and illuminate their hues more than ever before. That much is evident in the Blue Moon’s cushion brilliant cut: its softness and noble lines not only celebrate the stone’s other-worldliness, but also enhance its tone and saturation, transforming our perception of the coloured diamond from mineralogical curiosity to refined work of art – impossibly rare, limited only by nature and discovered only once in a blue moon. A gorgeous 7.47 carat Fancy Purplish Pink type IIa IF diamond ring (a very rare clarity grade and type) sold for $2,602,376 or $348,377 per carat, supports the value given to such rare fancy color diamonds. A 35.09 carat Kashmir Sapphire (the leading mine for blue sapphires, and the most valuable source) was sold for $7,450,045 or $212,312 per carat.